NRED Power points are available for anyone to view on the training section of the NRED website. Check them out all out there or though future blogs. Why be trained by NRED? 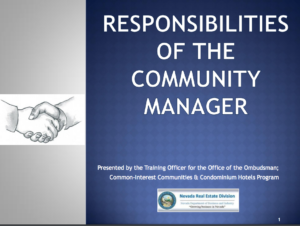 Learning from these FREE resources will reduce costly mistakes and transgressions by the current Board. In contrast, the attorney Clarkson trained the 2017 Board into handing over OUR wallets. 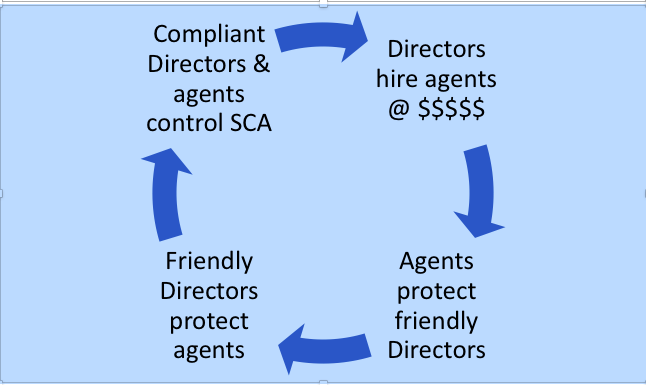 Look at this NRED training below that clarifies the Board’s job as the ounce of prevention that will save SCA a pound of excessive legal fees. A well-trained Board is a big – and necessary- step toward bridging the community divide. Here are two essential governance lessons that the 2017 Board REFUSED to learn. The buck stops with the Board. The Board MUST learn what its job is. The Board is not relieved of accountability by pretending that management or the attorney have decision-making authority. 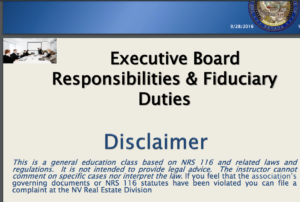 The Board is restricted by law from delegating ultimate accountability. The Board MUST define IN WRITING limits on the authority and actions of management and agents. Now, blurred lines allow the GM, the attorney, and individual directors (rather than the whole Board acting officially) to make decisions that ONLY the Board acting as a unit has the legal authority to make. but it didn’t follow the rules required for a valid Board decision? Here in SCA, these actions the GM took during the recall election diminished the integrity of the removal election process and could have biased the outcome in favor of the Directors who support her. GM served the four Directors facing recall by removing people from the process who were dedicated to protecting the integrity of the recall election process (me as a Board member and the entire Election Committee). 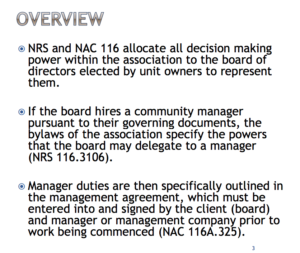 GM took away the authority of the volunteer Election Committee without approval by the only legal authority, i.e., vote by the non-conflicted Directors was required to change the Election Manual and spend un-budgeted funds. Rex worked with OSCAR to lie to the Election Committee to get them to remove me, a non-conflicted Director, as the liaison to the Election Committee after I attempted to protect the integrity of the election process. GM spent >$100,000 on a CPA and attorneys to do the volunteers’ job. GM allowed the paid interlopers to “lose” two pages of signatures which would have put Bob Burch on the recall ballot. GM disenfranchised the 2,001 voters who voted for me and kicked me off the Board without an official Board vote (on fake charges) at the EXACT SAME TIME as the recall process should have been controlled by me and the two other non-conflicted Directors. GM never officially notified the Board of the receipt of petitions to call for a removal election of four Directors who approved the GM’s double-the-market pay. GM never officially notified the Board of the receipt of a petition of no confidence against her. AT THE EXACT SAME TIME that those petitions were released to OSCAR, the opponents of the recall of the Directors who support her excessive pay. There is no end to this cycle without a properly trained Board. Without training, SCA is doomed to repeat history. 2015 Board, including Rex and Tom, hired the GM at double the market pay. Rex claims that, as President, he has the right to control which directors get to participate in Board decisions and routinely excluded Directors with dissenting opinions. Rex appointed Aletta and Bob to study committees. On the advice of the GM and without consulting owners, Aletta and Bob decided that owner committees should be weakened or abolished under self-management. GM’s power isn’t controlled by written executive limits. Independent candidates are discouraged from running for the Board. Independent Directors will not run for officer positions. Rex and Bob keep the leadership roles.